We will test your batteries and charge them if they are discharged, if that is the appropriate course of action. 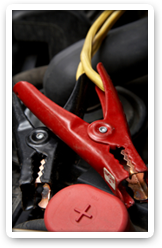 We install batteries in most cars and light trucks. Along with your automotive battery purchase, we provide free periodic testing of the battery and your car's charging system up to twice a year. Custom battery cables can be made to your specifications. Many sizes of cable are always in stock. Due to the increasing complexity of automobile cables you may only be able to use original equipment cables. The battery packs for a variety of different power tools can be rebuilt. New cells can be placed in your case when cost and availability are an issue. We specialize in rebuilding DeWalt, Craftsman, Porter Cable, Milwaukee, and other packs. Custom battery packs for a large variety of equipment are increasingly a part of our business and save our customers a great deal of money over buying the battery from the manufacturer of the unit. In addition to selling name brand chargers, we also are able to repair many malfunctioning chargers. This, of course, is dependent on the availability of schematics, parts and cost viability.